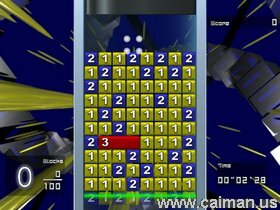 Caiman free games: Blocksum by Shintaro Sato, Ginger, xor. 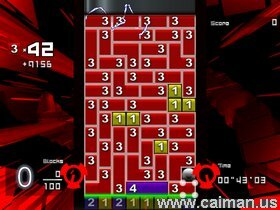 In this game your aim is to add numbers (blocks) to each other. In order to destroy blocks you need to make few same numbers to each other. In order to destroy block with number two you need only two blocks next to reach other, but in order to destroy chain of blocks with number ten you need ten similar chain connected to each other. You also can make combos: If you destroy 20 blocks with number 3 in one moment it is worh much more point then destroying same amount of blocks separatly. To sum up: it is excellent game for those who like tetris, puyo-puyo or similar game. And unlike many others it is unique. Mirror download (maybe in Japanese) .